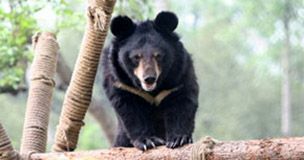 Bear bile farming is entrenched in Phung Thuong village but consistent outreach over years has convinced the first farmer to give up their bear. A long rehabilitation process is expected for moon bear Amy as starvation and dehydration means vets dare not yet risk surgery. 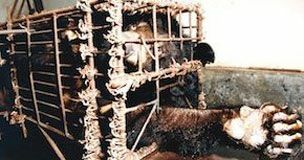 Years of outreach has resulted in the secret rescue of female moon bear Amy who has suffered more than a decade of cruelty and neglect. For $45 a month, you can sponsor a rescued bear. $35 a month could pay for a dozen fruity ice blocks that keep the bears active and stimulated. $15 a month could provide two bears with dried fruit and nuts, an essential part of their diet. $10 a month could keep four recovering bears supplied with plus-size fruit smoothies that disguise the taste of their medicines. $195, could provide a rescued bear with vet care for a month. $140 could buy the bears a swing to relax on in their enclosure. For $80, you can befriend a rescued bear. $55 could buy fruit smoothies for our bears. $35 could buy a small bobbin/spool for our bears. 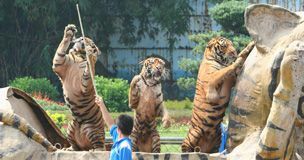 $25 could support one volunteer to investigate one zoo for one day. $11 could vaccinate one dog against rabies. 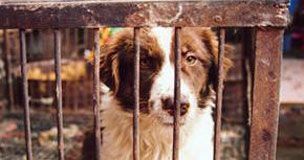 Outbreaks of rabies often prompt brutal dog culls in China. $8 could buy a pot of honey – the bears’ favourite treat.